When the hit drama Downton Abbey ends its six season run later this year (in the UK at least), it’s going to leave a big hole for its channel, ITV. Now, in a new interview, ITV execs suggested a science fiction show could take its place as the channel’s big prestige drama. 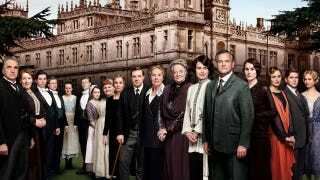 I genuinely think that the new Downton won’t be a country-house drama in the Edwardian period. The danger is that we say, ‘Edwardian period drama in that tone works – the new Downton will be something similar’. The new Downton might be sci-fi, it might be something completely different. Which isn’t really saying much. The new show almost certainly wouldn’t be written by Downton mastermind Julian Fellowes, and it may not turn out to be science fiction at all. But even the chance that a science fiction concept could be treated with the same respect and detail as Downton Abbey is certainly a story worth keeping an eye on.